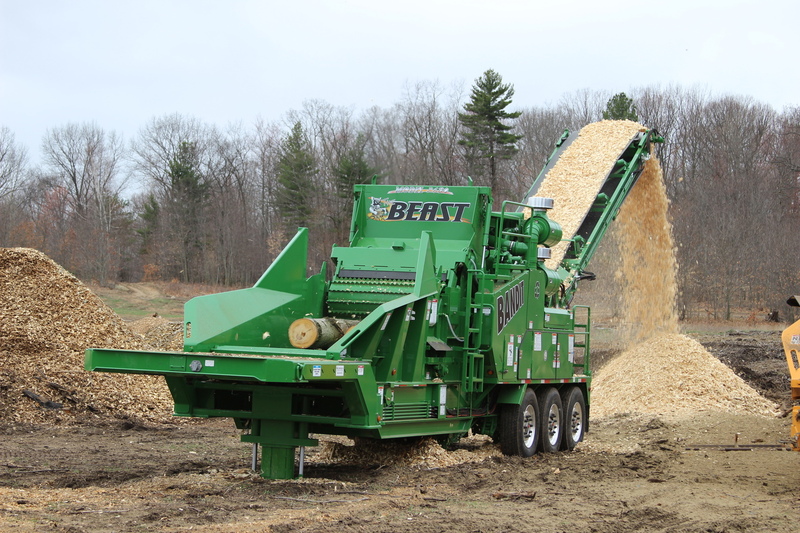 Matching the productivity of The Beast® horizontal grinder with the raw chipping power of a Bandit whole tree chipper is as easy as the optional whole tree chipper drum for The Beast. After the initial installation or retrofit, it’s a relatively straightforward swap – switch out the standard cuttermill on The Beast with a custom 5/10-knife, 4/8-knife or 20-knife drum, and add a specially designed stationary anvil spacer to the infeed. (The 5/10 knife drum is a 10-knife drum, but it can be run with half the knife pockets blocked off. The same goes for the 4/8 knife drum, and the 20-knife drum.) With a setup like that, there’s no need to trade production for chip quality. But to understand why The Beast with a chipping drum is such an elegant solution, you have to understand what makes Bandit’s horizontal grinders stand out among the crowd. It starts with the patented cuttermill. Bandit has engineered The Beast to have a downturning cuttermill, where most other horizontal grinders turn upward. This setup allows The Beast to cut against a one-piece infeed chain, which serves as a moving anvil – a tremendous advantage over the competition. 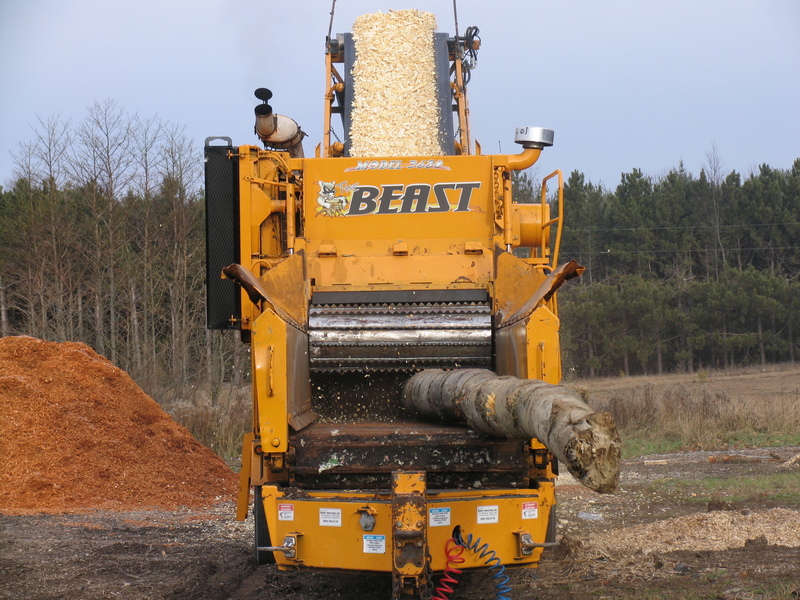 When running with a chipper drum, The Beast cuts against a replaceable stationary anvil insert that sits at the end of the infeed, rather than the infeed chain. This setup ensures a higher quality chip. This helps prevent material from turning or rolling, which results in a better quality chip. The downward cutting action also is more aggressive than up-turning cutting systems, allowing the entire feed system to provide better control of the material as it’s being fed into the chipper. Bandit’s one-piece infeed chain also plays an important role in ensuring a higher chip quality. It does so by constantly advancing material into the feed wheel yoke and into the chipping drum. The heavy-duty construction on the infeed chain has proven to be far more effective and more reliable than the chains in other grinders, while helping to deliver a superior end product. A six-speed feed system slows the operator to match the conveyor speed to the size of the material desired. This keeps material from pushing against the chipping drum, causing a braking action that can rob horsepower and fuel economy. And it also prevents material from not reaching the drum fast enough, which can create splinters and fines. The six-speed system can be further fine-tuned so you can create the right-sized material on the first pass. 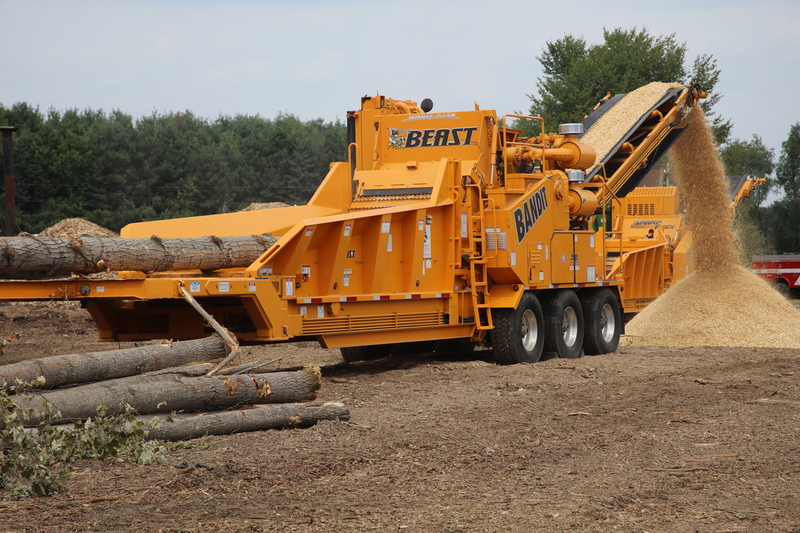 The massive infeed widths on the Model 2680XP and 3680XP also mean these machines can handle the largest, widest trees possible. The 60-inch wide infeed allows for material to be spread out evenly along the infeed chain, giving logs, chunk wood, stumps, and even regrind mulch plenty of room. And all of the benefits of Bandit’s downturn mill still apply with a chipping drum. It’s easy to see why The Beast can be your best whole tree chipper. But you can process more than just wood products. The chipping drum option can offer a huge advantage when processing plastic materials, like heavy walled plastic pipe. Often outfitted with the 20-knife option, chipping hard walled plastic pipe creates uniform and perfectly sized plastic chips that are exactly what plastic recyclers are looking for. The 4/8 and the 5/10 knife drum, depending on if all the knives are utilized or if half of them are blocked off, can produce a 2” maxi chip for biomass boilers, a ¾” standard chip. A 20-knife drum can produce a ¼” to 3/8” microchip when all the knives are utilized. Blocking off half the knife pockets can produce a standard ¾” to 1” chip. But perhaps the greatest advantage a chipping knife option The Beast is you’re not stuck with mill. You can swap your chipping drum back to the traditional cuttermill, and enjoy the advantages of nearly limitless tooth and raker options, giving operators that ability to pick and choose the correct hardware to process nearly anything from chunk wood down to branches and logging slash. The Beast can change with the times – providing a product to meet the demands of the always-changing markets. And no matter how long The Beast has been in service, Bandit will stand by its product with free expert support only a phone call away. Bandit offers this service through our Bandit Backbone program.